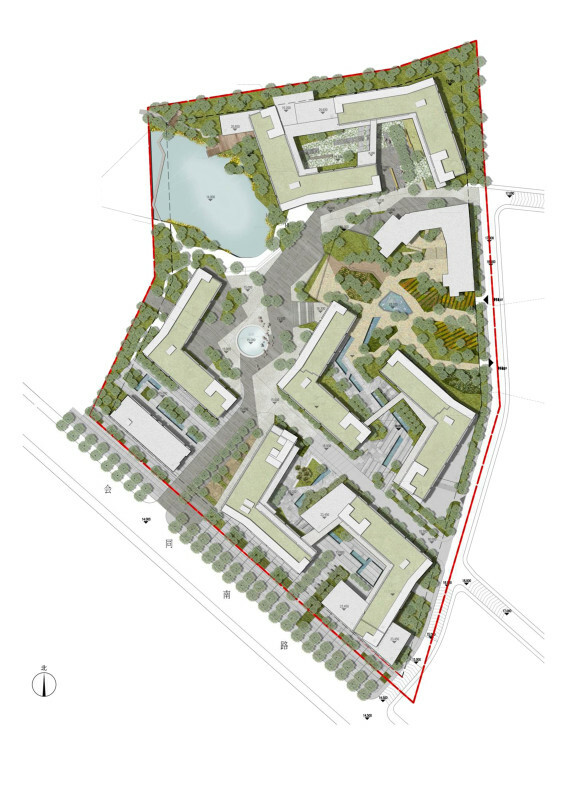 With an understanding of the integration of the university campus and the cultural centre and the location of the site next to the main street (Huitong South Road), the overall planning strategy is to put all public landscape courtyards/ plaza closer to the south where they can be engaged and easily accessible to all public. 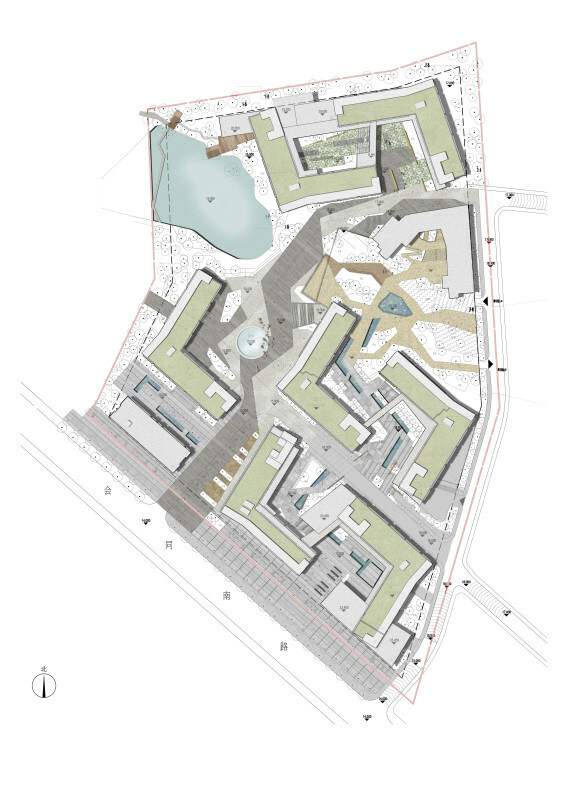 At the same time the landscape courtyards/ plaza integrate better with the adjacent cultural facilities. 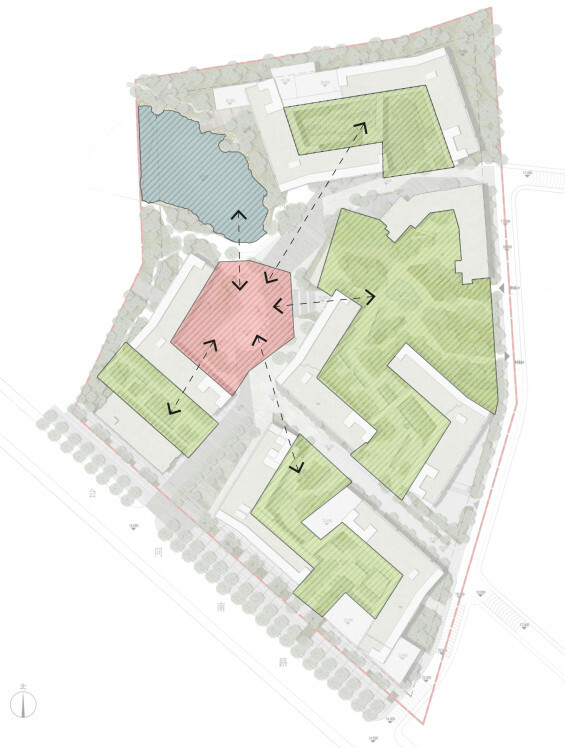 This will also be where student quarters will be located with a small local hostel, community facilities and supermarket will be located providing services to the local residents, the students and those who are visiting this university town. 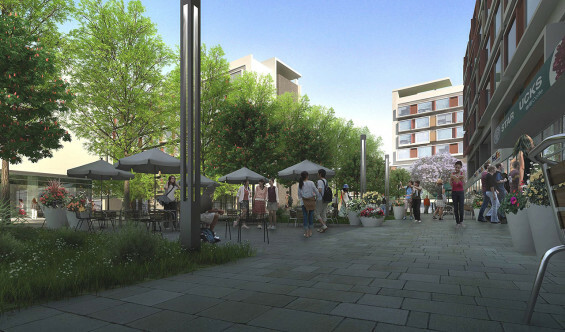 A more active community life will be provided for students who prefer slight vibrant setting. 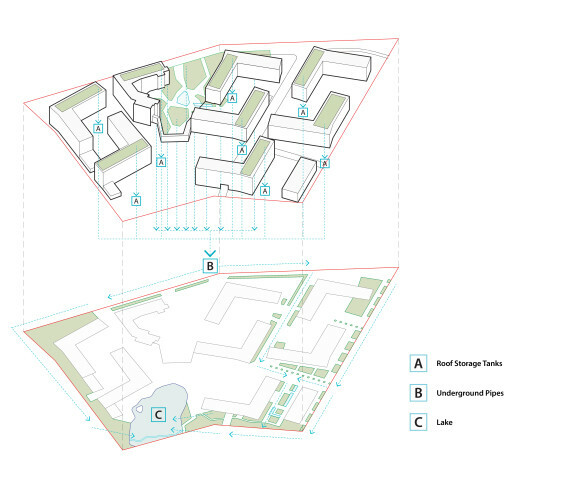 The semi-public student quarter will be located to the north where more quiet and natural greenery will be provided. 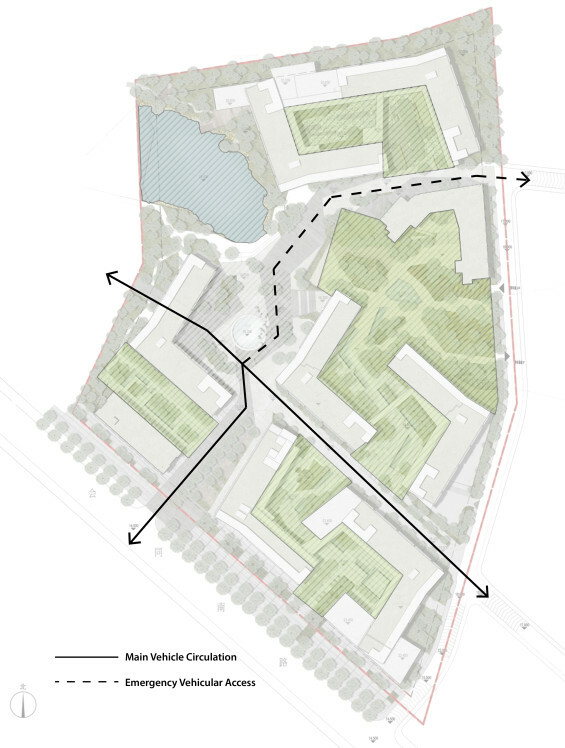 The existing mountain with dense natural vegetation on the north provides a stronger background and integrates with the green landscape courtyards and the green spine of the university campus. 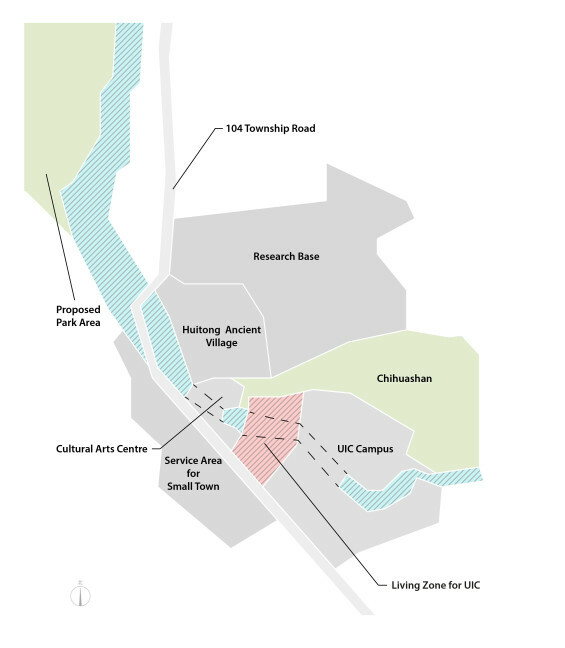 The green spine will continue from the university campus to the art cultural centre to west of the site. From west boundary, it encompasses a lake, a central plaza and a podium landscape (with outdoor classroom and an urban farm). Underneath the podium landscape are the supermarket, canteens and student facilities. All buildings are designed to create different types of spatial enclosures as courtyards and open plaza in relation to different ground levels and podium landscape, as well as integrating with different indoor/ outdoor public and semi-public spaces. The central plaza as the center of the whole site connects different open spaces. A water fountain with interplay of jets/ mists, arrangement of natural boulders and ambience night lighting create a landmark and meeting place for any students/ residents/ visitors who travel around here. For the student quarters, vehicular circulation is limited only to the main east west street connecting the cultural center and the university campus and the vehicular entrance from Huitong South Road. 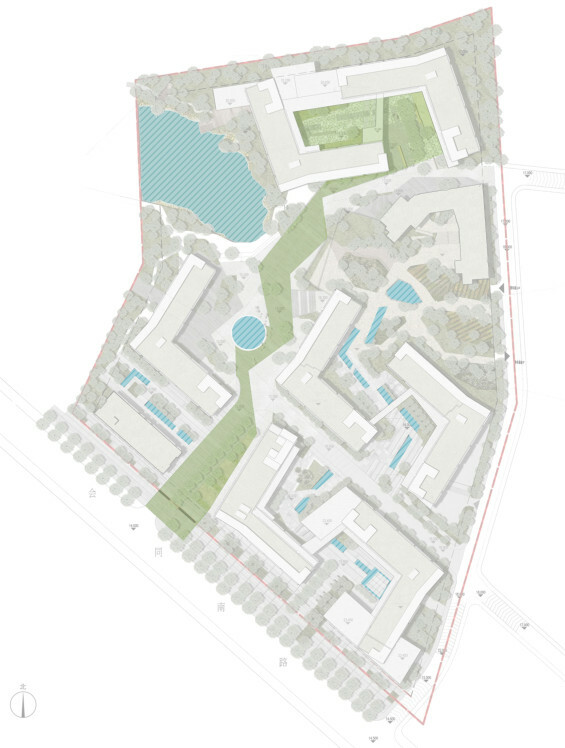 The green spine as the main open space for the student quarter and the university campus promote a healthy living style with no car zone and encourage pedestrian and social environment. The dialogue between human and nature is emphasized as an important factor for living in this university town. 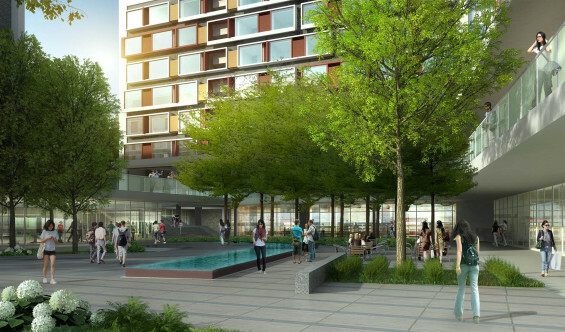 Different water features flowing through the courtyards are designed to connect all open spaces. They integrate with the zig-zag paving pattern strengthen the flow of the whole landscape. Chinese rock garden in the northern courtyard cleanses and stimulates the mind create a dry water garden in a quiet secluded setting. Different rain gardens are created along the perimeter of the site and along the streets for collection, infiltration, cleansing and re-routing to the lake during rainfall. All rainwater to be collected from the green roofs will be stored temporary in individual storage tanks. The rain water will be reused for planting irrigation. When water in the tanks overflow, it will flow through underground pipes to the wetland planting along the designated lake edge. The competition was organized by the Beijing Normal University– Hong Kong Baptist University United International College and Zhuhai Zhiyu Investment Limited (珠海市植譽投資有限公司) who is funding the development. United International College (UIC), situated in Zhuhai and jointly founded by Beijing Normal University and Hong Kong Baptist University (HKBU), is the first full-scale cooperation in higher education between the Mainland and Hong Kong. The competition was organized by the UIC and Zhuhai Zhiyu Investment Limited who is funding the development. 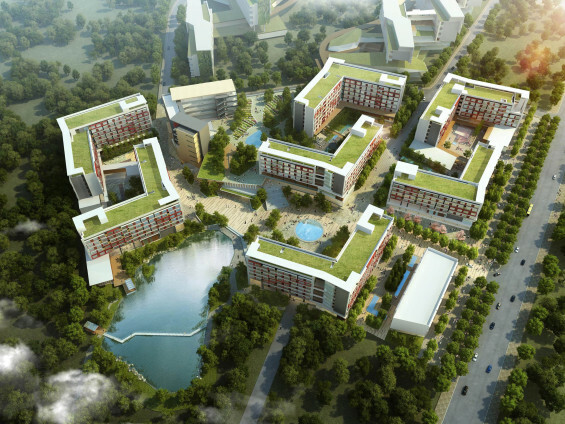 The proposed student quarter is located between the Cultural Arts Centre and the University campus at Huitong South Road, making it not only as a transitional space but a community center for the integration of the university into the future local township.